Can you believe the legendary Toyota Land Cruiser has been around since 1957? Elvis was in Graceland, Eisenhower was in the White House, and America's favorite off-road vehicle was already starting to show up in America's garages. Flash forward almost 60 years, and the Land Cruiser is Toyota's most luxurious SUV, but it has not forsaken its rugged off-road roots. If you want to see how highly-evolved the latest Land Cruiser is, drop by Charlottetown Toyota for a first-hand look at the 2016 model, available in a number different trim levels and accessory packages. Come in early for the best selection. We are centrally located at Charlottetown, PE, and highway-close to Charlottetown, Stratford, Mt. Herbert, Cornwall, Marshfield, Brackley, and Milton Station. 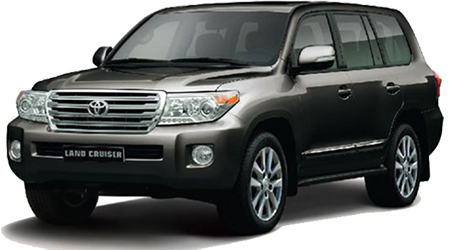 Everyone is welcome to test drive the 2016 Toyota Land Cruiser because it offers amazing features to please the pickiest perfectionists, and a fearless V8 engine to tackle the toughest terrain. Come to Charlottetown Toyota at PE, PE, and have a face-to-face meeting with the fabulous new Land Cruiser. It is difficult to describe the Land Cruiser's revered off-road capabilities, but let's just say the advanced new drivetrain and limited-slip differential will take you places other SUVs fear to tread. We will be more than happy to oblige and we love accompanying people on a thrilling ride in the ever-popular Land Cruiser. If you live in nearby Charlottetown, Stratford, Mt. Herbert, Cornwall, Marshfield, Brackley, and Milton Station, PE, you are close enough to make Charlottetown Toyota your destination dealership for the durable and hardy 2016 Toyota Land Cruiser.